Well, when it rains it pours, and it’s certainly been pouring here in Baltimore lately. This being only the second week in March, there’s going to be plenty more rain yet to fall this Spring. We don’t care what Marty Bass or Tom Tasselmyer has to say about it, it’s going to rain. Long and hard. And if you listen to the Chop instead of some inconsequential, trifling TV weathermen, we’ll have you dodging raindrops in style. Time was when a gentleman was expected to carry a gentleman’s umbrella. 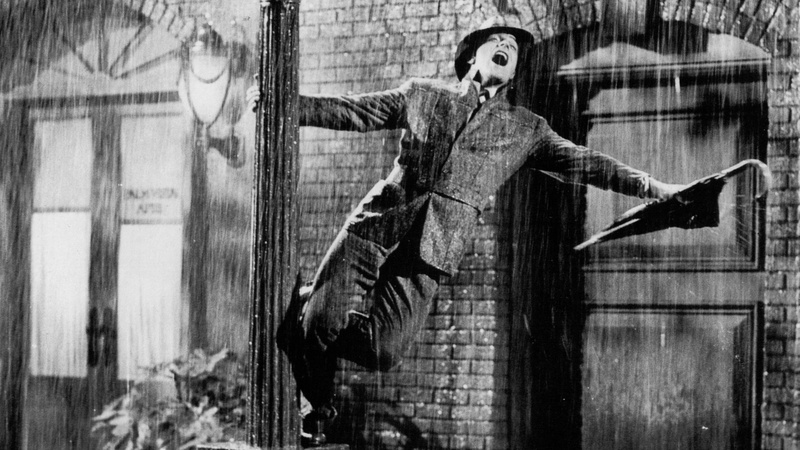 For looking dapper while you’re soaking from head to toe, it’s damn near impossible to top Gene Kelly in Singin’ in the Rain. No one has even come close in nearly 60 years. But while his jacket may be overdue for a comeback, his umbrella certainly is not. Your umbrella is not your grandfather’s walking stick. It doesn’t need to have a crooked handle made of African rhino horn or hand-carved mahogany. It doesn’t need a four-inch spear at its crown or a paraffin-dipped canvas shell. It doesn’t even need to cost more than $20. This look was flash as hell in 1952, but needs a little updating for the 21st century. While we typically recommend clothing and accessories made to a certain standard, and styled a little more elegantly than what passes muster on the street, we just can’t see any sense in buying a fancy umbrella for several reasons. A walking stick style umbrella is the bow-tie of a rainy day. It’s great for dandy old men, but it’s got no place over the head of a modern, stylish man under 50. When you take it out for a rainy night on the town, you’re going to have a few and forget it in the bar. If not, some other drunk is going to steal it. And they may be doing you a favor, since those things are big and clunky and spill water everywhere and catch the wind and jam mechanically and only really look right when you’re wearing a tie or overcoat anyway. Instead of thinking of the umbrella as a potential fashion accessory, we’d encourage you to think of it merely as a tool to keep the rain off your head. It should be as efficient and understated as possible, which is why we swear by the baton-style umbrella. Pound for pound they provide just as much surface area, with just a fraction of the size and weight. An umbrella can only keep you dry if you bother to carry it, and it’s much easier to carry a baton with you even when you only think it might rain that day. If it’s not raining, you can stow it away in your messenger bag or failing that, just jam it into your back pocket. This Ultra Mini model from Samsonite is a perfect example, and at $16.95, is generally available in department stores and other shops. Just keep the color neutral and hold it right-side-up and you can’t possibly go wrong.